In response to our invitation to a debate on autonomy for Jammu and Kashmir, we carry the first lot of comments. Is autonomy a panacea for Kashmir’s problems? THE demand for reorganisation of Jammu and Kashmir on the basis of unalterable geography and ground realities and devolution of power to the people of the three regions goes back to the time of accession of the state to India. To hand over the administration of the whole state to Sheikh Abdullah who had no locus standi outside Kashmir valley was a grave blunder. THE first thing India needs to do is to physically integrate the Kashmir state with the mainland India by gradually phasing out certain special provision acts. This would not only discourage Pakistan from exploiting local conditions in Kashmir, by claiming it as an irresolute land, but also allow Indian Muslim population of Kashmir to live with a sense of oneness with India. THE Jammu and Kashmir Government constituted a 6-member Regional Autonomy Committee on November 13, 1996. It was virtually an all-National Conference committee as Mr Balraj Puri was the only non-NC person on it. It’s EC’s right and duty! Why accord special status at all? AS Kashmir has legally acceded to India, it is an integral part of the country. Then why grant special status to J&K? Why to bestow more autonomy? A Kashmiri has access to all the amenities, facilities and rights like any other Indian. THE roads leading to the Amarnath cave have been crammed with cars, taxis, vans and buses over the past few weeks — all heading to the unique manifestation of Shiva in the holy cave at the fringe of the valley. WHEN J.M. Lyngdoh was appointed Election Commissioner by the H.D.Deve Gowda Government five years ago, it was thought to be an innocuous selection and taken little notice by the media. It was generally believed that the man from Meghalaya was picked up to appease the people of North-Eastern states. IT was meant to be a party with the difference. When the Bharatiya Janata Party appointed Venkaiah Naidu as the party president and inducted senior ministers to assist him, party cadres welcomed it as the right step. FULLY aware of the security drill involved (checking of each segment of the vehicle, to mention just one of the bandobasts), some of us went for the President's Independence day reception for curiosity's sake. THE demand for reorganisation of Jammu and Kashmir on the basis of unalterable geography and ground realities and devolution of power to the people of the three regions goes back to the time of accession of the state to India. To hand over the administration of the whole state to Sheikh Abdullah who had no locus standi outside Kashmir valley was a grave blunder. His demand for special status for the whole state was not acceptable to the people of Jammu and Ladakh. That is why opposition to incorporation of temporary Article 370 in the Indian Constitution began from the day one. The refusal of the Indian government to pay heed to this demand added to the distrust of people of Jammu and Ladakh about the bona fides of Sheikh Abdullah. 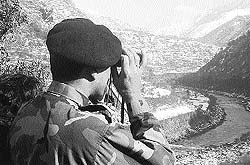 A Pakistani Brigadier looks at Indian positions along the Line of Control between Pakistan and Indian Kashmirs at Chakoti, 58 km southeast of Muzaffarabad, capital of Pakistan Occupied Kashmir. Chief Minister Farooq Abdullah’s opposition to the reorganisation of the state on the basis of geography and devolution of power to the people of Jammu, Ladakh and the Kashmir valley is a legacy of Sheikh Abdullah. 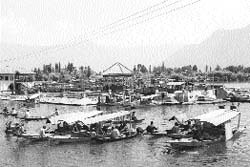 During a great famine in Kashmir around 1900 thousands of Kashmiri Muslims had migrated to the Doda area of Jammu across the Pir Panjal range. They multiplied fast and now constitute about 50 per cent of the population of Doda district. They have strong emotional and linguistic links with Kashmir and want to be a part of it. But the geographical hurdle of Pir Panjal mountain stands in the way. Dr Farooq Abdullah, therefore, wants to make it a separate region of the state through the division of Jammu region on communal lines. His approach is totally communal, parochial and anti-secular. Owing to over-representation given to the Kashmir valley in the State Assembly, Kashmiri Muslims have developed a kind of imperialistic tendency to dominate Jammu and Ladakh. The process of Islamisation of not only Kashmir but also Jammu and Ladakh has been going on side by side. As a result, Ladakh is on the verge of losing its distinct Buddhist identity. The growing grip of Kashmiri Muslims on the administration of Jammu is a major factor in the extension of Islamic terrorism in Jammu. This has made the people of Jammu including its non-Kashmiri Muslim population desperate. They now want complete administrative de-link of Jammu and Kashmir through reorganisation of the state and formation of a separate Jammu state. It would be bigger in area and population and economically more viable than Uttaranchal and Himachal Pradesh. People of Jammu and Ladakh do not want any kind of special status and more autonomy. But, surely, they would not oppose special status for Kashmir valley within the framework of the Indian Constitution. Dr Farooq Abdullah cannot be allowed to impose autonomy of his conception on Jammu and Ladakh. To describe the reorganisation of the state on the basis of geography and ground realities as trifurcation of the state on communal lines is to betray a communal, anti-secular and anti-national mindset. The problem of resettlement of about half a million Kashmiri Hindus who have been driven out of Kashmir during the last 50 years, particularly since 1989, and a new set up for Punjabi speaking Uri-Titwal belt which has little in common with Kashmir is ticklish. Kashmir Pundits cannot go back to their original homes scattered all over the valley. Their demand for a well-demarcated secure area in the southern part of the valley is reasonable and justifiable. A high-powered commission must be set up to find a workable solution of this problem. Uri-Titwal can be made an autonomous district or a Union Territory. The developing situation in and around Jammu and Kashmir demands that policy-makers and opinion makers of India adopt a positive, secular and feasible approach regarding the demand for reorganistion of the state and rehabilitation of Kashmir Hindus in Kashmir. The writer is a former Member of Parliament. THE first thing India needs to do is to physically integrate the Kashmir state with the mainland India by gradually phasing out certain special provision acts. This would not only discourage Pakistan from exploiting local conditions in Kashmir, by claiming it as an irresolute land, but also allow Indian Muslim population of Kashmir to live with a sense of oneness with India. But by keeping Kashmir as a live issue, we have given legitimacy to Pakistan to use it as a weapon against us. India must decide decisively on the accession issue once and for all. Integrity of territory is not negotiable, said Switzerland following revolt in the 19th century. While fighting secessionist trends of confederates, the American bottomline was that the USA is an indestructible union of indestructible states. The government of India too has an uncompromising stand as far as the territorial integrity of the country is concerned. But her ill-conceived, misguided and indecisive policies over Kashmir have finally made the state a focus of international attention. The country has been insisting for bilateral resolve to Kashmir dispute. But at no time India has ever tried to attend to the problem from close quarters . We did not allow the military to take back Kashmir in 1948 nor later tried to strengthen Indian part of Kashmir politically and constitutionally. The Centre even promoted and supported the National Conference as a single ruling party in the state, but the latter finally stabbed the country by approving the Autonomy Bill in the state legislature. As elections will be held in the state, the local leadership should be allowed to grow, mature and indoctrinate itself. At least the nation doesn't carry any longer the fear of demand for autonomy, from the state. At the same time, any new party cannot hijack the state or declare independence arbitrarily. But the change would certainly provide the state a healthy political system. The Kashmir syndrome is very much in existence. The Government of India should take hard policy decisions. We must try to make Kashmiris feel as a part of India and allow inter-and intra-migration of population. We must not allow local hostile elements to have a field day. It was feared that if Mr Geelani were arrested, the Jhelum would be on fire, but nothing happened. The Government must show credibility and good governance in letter and spirit. As the rising unemployment is contributing to the present unrest, the industrial spectrum, with immense job potential, should be strengthened. Kashmir could be developed as another Switzerland of Asia to give a fillip to the state income as also engage the locals for various jobs. Further, the state climate is quite congenial to the manufacturer of precision equipment, such as electronic machinery, scientific and optical instruments, jewellery etc. There are big quarries of black stone marble, bauxite, iron, cement, limestone, brick earth, coal etc., which offer a large scope for the development of small-scale industrial units. We need a mechanism supported by human strength, that helps fight the menace of sabotage and subversion more from within. The Centre has to make a two-pronged attack. One, to wean away Kashmiris from Pakistan and two, win the locals, their mind and confidence. This requires a good propaganda machinery to expose Pakistan and its designs. Kashmiris should be mobilised first against Pakistan and later sub-summed into the national stream. Give people of Kashmir a platform to air their views and restore and strengthen the local administration. We must open as many as fronts as possible to pay Pakistan in the same coin. We should propagate to Sindhis and Muhazirs about government atrocities on them. We must exploit their insecurity and anger by creating communal incidents in Pakistan; and bring divisions between Shia-Sunni, North-South, Muhazir-Sindhis, Punjabi-Non-Punjabis and people of Northwest frontier to maximum advantage. We must assure Pakistan that terrorism can be with them also. It will only make Pakistan realise to shift its concentration because when your own house is burning, you prioritise differently. We must remember that infirmities will not yield instead firm actions might pay. The writer is Reader, Centre for Defence & National Security Studies, Panjab University, Chandigarh. THE Jammu and Kashmir Government constituted a 6-member Regional Autonomy Committee (RAC) on November 13, 1996. It was virtually an all-National Conference (NC) committee as Mr Balraj Puri was the only non-NC person on it. The RAC spent nearly Rs 1.5 million and took as many as 28 months and one day to prepare the 24-page report, which was endorsed by the State Cabinet in January 2000. It was the fourth in the series of such committees appointed to suggest remedial measures that could harmonise relations between Kashmir and Jammu and between the former and Ladakh. The other three were the Gajendragadkar Commission (1967), the Sikri Commission (1979) and the Wazir Commission (1980). They found the complaints of Jammu and Ladakh people well founded. These commissions had recommended three fully empowered regional development boards for Jammu, Kashmir and Ladakh; 50 per cent representation to Jammu in the State Cabinet; inclusion of at least one Ladakhi in the Cabinet; and the creation of three more districts of Kishatwar, Reasi and Samba (Bahu) in the Jammu region. The Gajendragadkar Commission said that the political aspirations of the different regions of the State should be satisfied. The official response was totally negative and somewhat provocative. The natural fall-out of this attitude was the aggravation of the Jammu and Ladakh's political scene and the setting up of the RAC. According to the ruling NC, the RAC report does contain a definite reform scheme which for the first time offers to Jammu and Ladakh a fair share in the State's polity and economy. However, people of Jammu and Ladakh do not share the views of the NC. In fact, they have rejected the report as a “dubious and communal document” and as an affront to their self-respect and sought its immediate withdrawal. The bitter opposition of the people of Jammu and Ladakh to the RAC report just cannot be dismissed as something silly. A perusal of the report clearly shows that the RAC's single point agenda was to (mis)use religion as a tool in order to demolish the age-old regional identity of Jammu and Ladakh and create an impression that the people who inhabit these backward areas are not a homogenous political mass. It would also reveal that the sole gameplan of the RAC was to provoke intra-regional tensions and conflicts in the otherwise peaceful Jammu and Ladakh by constructing new and imaginary identities and setting the followers of one religion against the other and scuttle the whole issue of empowerment for which the Jammuites and Ladakhis have been struggling since decades. How else would one interpret the RAC's recommendation that divides the virtually ethnically and culturally one Jammu region into the Muslim-majority Chenab Valley (Doda district and Mahore tehsil) and Pir Panjal (Poonch and Rajouri districts) provinces and the Hindu-majority Jammu province (Jammu, Kathua and Udhampur (excluding Mahore tehsil districts)? Similarly, how else can one explain the bifurcation of the 100 per cent Mongolite Ladakh into the Shia-dominated, Kargil and the Buddhist-majority Ladakh (read Leh district)? The division of the existing Jammu and Ladakh regions into five provinces on purely communal lines constitutes one of the two most undesirable and disturbing parts of the RAC report. The other is the outright refusal on the part of the RAC to concede the 55-year-old demand of the people of Jammu and Ladakh in favour of a political instrument that invests them with adequate legislative, executive and financial powers. The committee does recommend the creation of “Provincial/ Regional/District Councils”, but these are all toothless, powerless and devoid of any real legislative, executive and financial authority. In fact, the RAC puts a big rider by making it loud and clear that “the grant of autonomy to Jammu and Ladakh shall, in no way, affect the institutions of the state like Governor, Chief Minister and his Cabinet, Legislative Assembly, Judiciary and State cadre of services. These institutions shall continue as they are”. While doing so, the RAC ignores the most vital fact that autonomy is a definite political concept and that autonomy without the power to legislate is a sham and meaningless. The truth is that there is nothing whatsoever in the report which could in any way and in any sphere empower the aggrieved Jammuites and Ladakhis. On the other hand, it contains everything which the potential of disturbing the socio-religious and political equilibrium in Jammu and Ladakh and thwarting and delaying indefinitely their most cherished goal of empowerment under the Indian Constitution, minus Article 370. The RAC is riddled with several other flaws. For example, the report nowhere defines the relationship among the proposed divisions, between them and the proposed 'Provincial Councils, between the divisions and the State and between the Provincial Councils and the State. Likewise, it nowhere talks of relations between the proposed District Councils within the region and the existing divisional administrative set-up or the proposed Provincial Council. The powers-that-be in Srinagar would do well to throw this “dubious” document in the Jhelum, eschew any such move as is aimed at communalising the well-defined regional identities, adopt a positive attitude to the problems being faced by the people of Jammu and Ladakh and concede their age-old demand that seeks reorganisation of Jammu and Kashmir on regional basis. The best course for them would be to support the idea of Jammu and Kashmir’s trifurcation into Jammu, Kashmir and Ladakh states. The sooner they do so, the better. For, this is the only panacea for curing the ills afflicting Jammu and Ladakh and enable New Delhi to start a meaningful dialogue with Kashmiri leaders of all shades of opinion. The Centre should also hold talks with those representing the over three-lakh internally-displaced Kashmiri Hindus, to find out what could conciliate them and their constituencies. They must remember that trifurcation of the state is an elixir and not poison as is being made out to be by some politicians. The writer is Professor of History in Jammu University and Member, Indian Council of Historical Research, New Delhi. AS Kashmir has legally acceded to India, it is an integral part of the country. Then why grant special status to J&K? Why to bestow more autonomy? A Kashmiri has access to all the amenities, facilities and rights like any other Indian. Do Kashmiris in POK have political rights — right to free and fair elections, right to vote, a self-autonomous development state council or an exclusive penal code like Indian Kashmiris? It won't be wrong to say that J&K has enough autonomy to serve people better, because it has an autonomous development state council. Besides there is no discrimination in the matter of allocation of funds for development of Kashmiris. The need of the hour is not granting more autonomy but a determined and selfless leadership. There is a need to work out plans for solving the problems of men and militants within a secular framework, free from the impact of the Pakistani propaganda. Yes, autonomy to the state government does ensure peace and development. But J&K has enough of it. There is no question of according pre-1953 status to J&K as first, it is against the federal setup of the country. Secondly, it is no remedy to the Pak-organised terrorism. Thirdly, it will bring no justice to the displaced Kashmiri Hindu minority. Today Jammu and Kashmir is on the crossroads because of the blunders committed in the past. Yet, there is a road which leads to betterment and development, provided both the Centre and the state work hand in hand instead of indulging in a tug of war on autonomy. UNDUE delay on the part of Maharaja Hari Singh to throw Kashmir's lot with India and subsequent events like the invasion of Mahajindeens supported by Pakistan's regulars to unsurp Jammu and Kashmir and the mind-boggling decision of Pandit Jawaharlal Nehru to refer the Kashmir issue to the United Nations are preludes to the prevalent turmoil in J&K. Opinions from across the border reveal that jehadis who migrated to Pakistan in 1947 could not forget the bitter memories of the Partition and the humiliation of 1971. They started their freedom movement with the active support of Pakistan's military regime. The movement got further impetus from the rigging of the 1987 elections, the alienation of the Muslim population from the national mainstream, poor economic growth and the ever-increasing unemployment in the state. Trifurcation and pre-1953 status on autonomy are no solutions to the problem because either of the two or both cannot remove the underlying causes of the unrest. Moreover, autonomy to J&K could open the Pandora's box for other states to follow suit. We need to formulate implicitly efficacious counter-terrorist policy with the sole aim of serving national interest. Security forces can harvest rich dividends by hitting the terrorists hard as jehadis will expose themselves more often while attacking political leaders especially during the elections. Free and fair elections may restore the common man's faith in democracy. Hurriyat leaders, though reluctant for fear of losing, might be persuaded to participate in the elections. Development, generation of more jobs for the youth, sustained national integration campaign, and introduction educational reforms in the state will bring in lasting peace. History is witness to the fact that insurgency devoid of any worthwhile foundation cannot withstand the resolve of a determined nation. THE roads leading to the Amarnath cave have been crammed with cars, taxis, vans and buses over the past few weeks — all heading to the unique manifestation of Shiva in the holy cave at the fringe of the valley. The mountain cave is only accessible in summer but remains cold enough to house a cylindrical figure of ice — formed by dripping water — that manifests Shiva. Its worship climaxes with the full moon of this month, which is later this week. Since the recent attacks on pilgrims, there have been far fewer vehicles, more of them buses than cars or taxis. In them have been more mendicants than the chunk of middle class north India that used to pack themselves into those cars and taxis. Security has been tightened after militants’ attack on Amarnath pilgrims in Nunwun Pahalgam. Their participation is a relatively new trend. Before Kashmir's militancy began, most of the much fewer pilgrims were mendicant sadhus, who were used to making such arduous treks on foot. If Right-wing, middle-class families have flocking to join the sadhus now, it has been ironically as much to symbolically challenge Islamic militancy as out of religiosity. This trend began after a threat to the pilgrimage in 1994 from Harkat-ul Ansar — which is linked to the Taliban — and some other militant outfits. They had announced that they would kill anyone participating in the pilgrimage or facilitating it that year. The large numbers that turned out to defy their “ban” made the militants more determined to thwart the pilgrimage. So, attacks on pilgrims, and an equally doughty enthusiasm to make the trip, are now an annual cycle of action and reaction. The result: For a couple of months every summer, the administration and the security forces, already stretched by the constant struggle to combat militancy, get sucked into arrangements to ensure the pilgrims' security. From the Governor to the constables who line the route, direct pilgrims and secure their camps, few in government have much time for anything else for about a month. No one in the government, or among the pilgrims, seems to consider the psychological impact of all this on common Kashmiris. Muslims, 99 per cent of the local population, must surely wonder at their government and police being so devoted to protect a Hindu religious function — which is not even of particular significance to Kashmiri Pandits. Those who want to alienate Kashmiri Muslims from India automatically score a point. The armed forces in particular seem to be oblivious to this kind of psychological impact. In their zeal to facilitate the annual fair a couple of months ago at the Khir Bhawani temple (the foremost Kashmiri Pandit shrine), several military units strung banners in Hindi across the highway. On many of the banners, welcoming pilgrims in the names of particular army and Border Security Force units, they had boldly painted Hindu symbols. The forces thus provide basis for the notion, already cultivated by pan-Islamist propaganda, that Indian forces in Kashmir are a Hindu army oppressing a Muslim people. The fact is that many Kashmiris even look askance at the recently acquired habit of security units to fly huge silken flags of the national tricolour from every street-corner bunker. To the men hoisting them, it is an unexceptionable act of patriotism. Over the years, Pakistan's propaganda has been far more sophisticated, and relentless, than India's. Indeed, Indian strategists have too often treated the insurgency as a war, albeit a proxy war, that they must win rather than as a challenge for them to win the minds, if not also the hearts, of Kashmir's Muslims. If Kashmir is to remain the proof of India's secular credentials, it must first be able to see the quality of deeply ingrained secularism, and sensitivity, in every action of government — and of the forces which, too often, are the aspect of India most visible to Kashmiris. It was for the first time that an officer belonging to the far-flung region was appointed to the high-profile job bypassing such an influential contender as the then Home Secretary, K. Padmanabhaiah. Lyngdoh then held the rank of Secretary in the Cabinet Secretariat. On his part, the new Election Commissioner, maintained a low profile; rarely opening his mouth or trying to project himself. Those were post-T.N.Seshan days and the Election Commission had been reeling under the influence of “activism” set in motion by Seshan. Seshan’s successor, M.S. Gill, pursued the activism of an independent Election Commission but democratised the Commission’s functioning in contrast to Seshan’s steamroller style. Coming from the North-East and little known in Delhi, Lyngdoh was thought to be a “goody-goody” person who lacked initiative and drive. How mistaken were those who thought so including the media “Pandits”. Inquiry with Lyngdoh’s contemporaries in the Indian Administrative Service and those who have worked with him reveal that he is among a few in the IAS who possesses three sterling qualities: integrity, intelligence and competence. Also, he is absolutely immune to influence from any quarter. Being quite senior in the hierarchy, Lyngdoh was sounded by Deve Gowda for the Cabinet Secretary’s post but his reply was a firm “No”. The reason; his colleague T.S.R. Subramaniam was senior to him but, for whatever reason, the then Prime Minister preferred Lyngdoh. His comment at that time was “I do not believe in superseding senior officers”. Subramaniam thus became the Cabinet Secretary and Lyngdoh, after retirement, was appointed Election Commissioner in the three-member Election Commission. A Khasi from Meghalaya, Lyngdoh abhors sycophancy, has no political leanings and is not known for losing temper. He must have been hurt when the BJP spokesman doubted his integrity and obliquely accused him of being a Congress agent. The BJP’s high-flying Spokesman Arun Jaitely must be regretting having a swipe at the CEC and then retracting, as if, eating back his own words. Also, there must have been grave provocation for Lyngdoh’s outburst during an on-the-spot assessment of the situation in Gujarat. Evidently, the state officers tried to mislead him and got a tongue lashing from the CEC — too seasoned and upright an officer to be taken for a ride. He is, after all, a high constitutional authority and has to take a vital decision; if the situation is conducive for holding election in the communally surcharged Gujarat. Compare Lyngdoh’s style of functioning as CEC with his two predecessors —flamboyant Seshan and self-projecting Gill and the IAS from Meghalaya is proving to be more pragmatic and forthright in vital decision making. Unlike his distinguished predecessors, he considers himself a representative of the Commission and not a separate entity; involves his two colleagues in the decision-making process. Gill’s experience, in his own words was: “It was a challenge to run the three-member Commission harmoniously and unanimously”. It is not so with Lyngdoh as his two colleagues — T.S. Krishnamurthy and B.B.Tandon function in perfect coordination and harmony with him. Lyngdoh’s term will run up to February, 2004 and it portends to be eventful. Low-profile Lyngdoh, appointed Chief Election Commissioner in June, this year, has many unknown facets of his personality and it is time now the voters must know their CEC — a high constitutional authority. His full name is James Michael Lyngdoh and his father was a highly respected Meghalaya judge. A Princeton product, Lyngdoh qualified for IAS in 1961 and allotted Bihar cadre. 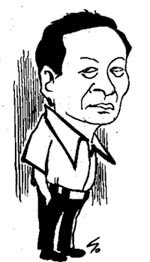 Soon he acquired the reputation for probity and regarded by state’s politicians as uncooperative. He refused to comply with what had been termed as “objectionable orders” of the then Bihar Chief Minister Kedar Pandey and had to go on leave. Like former Lok Sabha Speaker, P.A. Sangma, he is a Khasi tribal. Sangma holds him in high esteem and says the CEC is touchy about his self-respect and will never compromise on principles. Lyngdoh is a black belt in karate, exercises every morning and leads an austere and disciplined life. Also he has sound knowledge of French and German and his English diction perfect. After years of anonymity, he has now come in the limelight and his style of functioning reflects resoluteness. Though assertive, unlike Seshan, he is openminded on issues involving the Election Commission. IT was meant to be a party with the difference. When the Bharatiya Janata Party appointed Venkaiah Naidu as the party president and inducted senior ministers to assist him, party cadres welcomed it as the right step. Setting high ideals for the party, Naidu soon won the hearts of the rank and file of party and the large number of hangers-on around him is indicative of his new stature. The optimism is, however, turning out to be shortlived. The party is getting mired in one controversy after another in the last few days. To begin with, it was Petroleum Minister Ram Naik who came under a cloud for helping partymen and their families corner profitable petroleum ventures. The Vajpayee government had a tough time fire fighting. After Naik, it is the turn of Parliamentary Affairs Minister Pramod Mahajan to face the heat following allegations by the wife of a police officer, who is on the run. Venkaiah Naidu himself has come under the scanner following media reports that he was allegedly involved in a land scam in his home state of Andhra Pradesh. A senior party member while commenting on the turn of events remarked the party with a difference is falling flat on its face. The sprawling central lawns of Rashtrapati Bhavan appeared to be too small. The crowds were milling. The occasion was President A.P.J. Abdul Kalam’s reception on the Independence Day. The invitees were virtually Delhi’s who’s who — politicians, ministers, armed forces brass, diplomats, bureaucrats, journalists and distinguished writers. The President was seated on a sofa along with former President K.R.Narayanan and his wife, Prime Minister Vajpayee, former Prime Ministers P.V.Narasimha Rao and I.K.Gujral. The VVIPs were cordoned off by security personnel by fences and a thick rope. There were so many invitees wanting to have a darshan of the President. Impromptu, a queue had been formed. Suddenly, the President jumped up and lunged towards the queue where Marshal of the Indian Air Force, Arjan Singh, was standing to meet Dr Kalam. The President held Marshal Arjan Singh by the hand and brought him inside the makeshift enclosure. Needless to say, the people were floored by the Presidential gesture. The President, who is also the Supreme Commander of the three armed forces, had jumped protocol to receive Arjan Singh. Talking of the Presidential protocol, Kalam did away with the dress protocol which none of his predecessors in Rashtrapati Bhavan ever did. While sending invitations for the President’s customary high tea on Independence Day, care was taken not to mention any dress code. The President, however, stuck to the dress code of a bandgala suit. All of President Kalam’s predecessors had respected the British tradition about the formal dress code. This protocol was done away with on the explicit orders of the President. However, there is one protocol which still remains intact as far as the ceremonial get-togethers in Rashtrapati Bhavan are concerned. Children are still not allowed on such occasions. One can only assume that given the fancy of the bachelor President for children, this protocol may also be thrown into the Yamuna in the times to come. At a time when there is talk of Prime Minister Atal Behari Vajpayee being overshadowed by his deputy, L.K. Advani, the election of veteran Rajasthan leader Bhairon Singh Shekhawat as Vice President has brought him some cheer. Shekhawat, who won the elections with more votes than that was to accrue to him from the NDA, has already proved that he has friends cutting across party lines. This equation is expected to come in handy for Vajpayee. A trusted adviser of Vajpayee, the Prime Minister used Shekhawat’s services recently to convince mercurial Trinamool Congress leader Mamata Banerjee against leaving the NDA. Though Mamata did not oblige, she did not close her options completely. Observers say this is only the beginning. Shekhawat is expected to play an increasingly important role in the future to keep the equations tilted in Vajpayee’s favour. As the office of the “biggest political party in the world”, the All India Congress Committee premises at Akbar Road gets scores of visitors everyday. However, Congress workers and leaders are finding it increasingly difficult to get through to the AICC topbrass. While daily time restrictions have been imposed on the visitors, even scribes covering the party find it difficult to get in when Congress president Sonia Gandhi makes her rare appearance at the AICC office. Sonia mostly works from her residence, located next to the AICC office and important meetings of the party are normally held there. But when she recently held a meeting (with party observers for J-K polls) at the AICC headquarters after more than two months, even AICC office-bearers were denied entry by the SPG. Chandan Bagchi, a secretary at the AICC, had to shout at the top of his voice to move the SPG guards but it was not before party treasurer Motilal Vora’s intervention that he was allowed in. Same was the fate of several scribes stranded outside. The media department of the AICC has been taking things easy, thinking that Sonia’s appearances at AICC are few and far between. But for a political party waiting to come to power, restricting access may not be the best solution to the concerns of security of its top leaders. There is a new celebrity in the capital these days. Television personality Pratibha Advani, who kept a low profile all these days, has shot into prominence after her father L.K.Advani was elevated to the post of Deputy Prime Minister. Pratibha is getting featured in the glamorous page three of major dailies. Thankfully she is not interested in joining politics and emphasises that she would never use her father’s name in her professional life. Contributed by T.V.Lakshminarayan, Satish Misra, Prashant Sood and Rajeev Sharma. FULLY aware of the security drill involved (checking of each segment of the vehicle, to mention just one of the bandobasts), some of us went for the President's Independence day reception for curiosity's sake. To see whether the scientist President had introduced some changes at the protocol level. The first sign, of course, was apparent in the very invite which didn't specify any of the formal dress codes. That meant none of those stifling bandgalas for our men and women needn't be clad in formal saris. Several of the who's who were wearing salwar kameezes and long skirts. As one stepped inside, on the sprawling lawns of the Rashtrapati Bhavan, it was apparent that there were far too many guests (that is, more than the previous years) and to be spotted were some children from the Blind School. Confirmed a Rashtrapati Bhavan source, “Most of the previous years about 1,300 guests turned up, but this time there were 2,000 guests...the President had also invited 15 children from the Blind School”. I don't know what to write about the guests because they were the same faces that one sees on the circuit — civil servants, artists and dancers, retired personnel, diplomats — the majority of the envoys were in their traditional wear and added an interesting dimension. Also present were our politicians tagging along spouses (for a change). No, none of them looked tense or taut. In the backdrop of the petrol pump and land scams, one was under the impression that at least the prime players would look upset, but far from it. Those ministers jostled about merrily as though confident of their nexus moves and sure that nobody would throw uncomfortable queries at them. But here I must add that there has come about a maturity of sorts. For instance, nobody thronged around filmstar-turned, politician-turned Minister Vinod Khanna. He had come with his lawyer spouse Kavita who seemed to have spent the entire day at the hairdresser's for it was indeed an elaborate hairdo, but none made a beeline towards him or her. Many like Yamini Krishnamurthy didn't seem to be in that socialising mood and kept sipping coffee and standing quietly by themselves. On the other hand, Kathak dancer Uma Sharma was spotted in the queue, apparently eager to meet the President. Also very eager to meet the President seemed our art-knowall man, Rajeev Sethi. The queue kept on increasing as the time to depart neared. I am sure, many were left disappointed — this when the President spent 45 minutes going around and interacting with the guests. And before I move ahead I must also write that the President has equipped himself with a new Press Secretary, S.M.Khan, who was the CBI spokesperson till recently. A non-controversial man who is known to be extremely careful with every word he mouths. This week also saw the release of a biography on Air Marshal Arjan Singh. Published by Rupa, written by journalist Roopinder Singh, it was formally released by Defence Minister George Fernandes. Though the Minister's speech was laced with the transparency aspect, we all know how little we see of it in the actual functioning of the government. He requested Arjan Singh to pen his memoirs. Arjan Singh, originally a recipient of the King's Commission in the IAF, fought three wars. He has been on various diplomatic assignments and also served as the Lt.-Governor of Delhi. He is known to be a thorough gentleman. Roopinder Singh recounted the particular incident where a Air Force pilot had flown (I suppose without permission) a civilian on certain humanitarian grounds and when caught he pleaded his case before Arjan Singh who let him off with just a light warning — “I hope this won't happen again..."
Just after the book release ceremony, I couldn't help asking Arjan Singh's spouse what she thought of her husband. Looking around she smiled before quipping, " Now that he is not hearing I can say he is good..." And we all know the real test is when your spouse gives you the okay certificate.